Exchanging the vows and pledging your eternal love for each other is a moment that you will want to capture flawlessly. Take your wedding ceremony to a whole new level with an ostentatious arbor that reflects your mood and the significance of one of the most special days of your life. This goes without saying that the wedding venue is of utmost importance as the groom lays his eyes on the bride, walk down the aisle and then they vow to be with each through thick and thin for the rest of their lives in this setting. So, you can understand how vital this space is for any couple and you have to ensure that it is perfect. 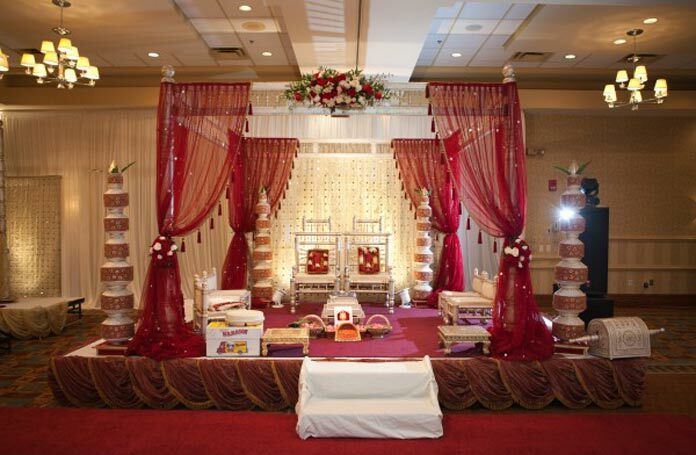 The wedding arches form an imperative inclusion in this décor. They have both cultural and religious values attached to them like they represent protection, divine presence and home among others. The modern couples embrace this curve for the décor and aesthetic purposes as well. A splendid arch can anchor an outdoor ceremony and give new meaning to this occasion by serving as a great photographic backdrop. With fabrics, flowers and the various builds, arches are not very complicated to make. But once done they are capable of fetching a great new look at the end of the aisle. 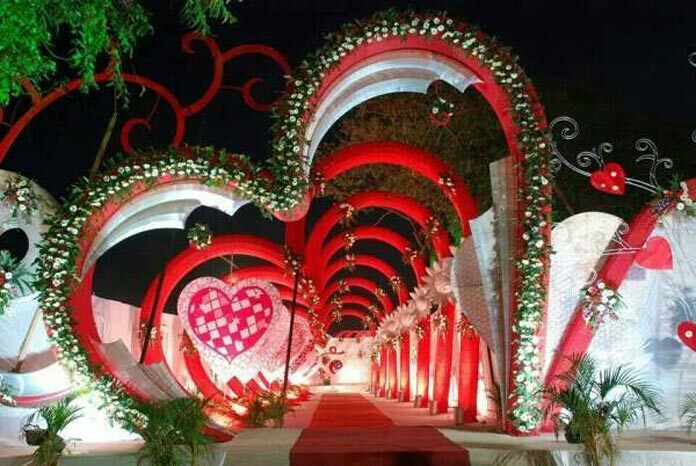 Here are some of the most popular types of garden wedding arch decorations. Just read on. 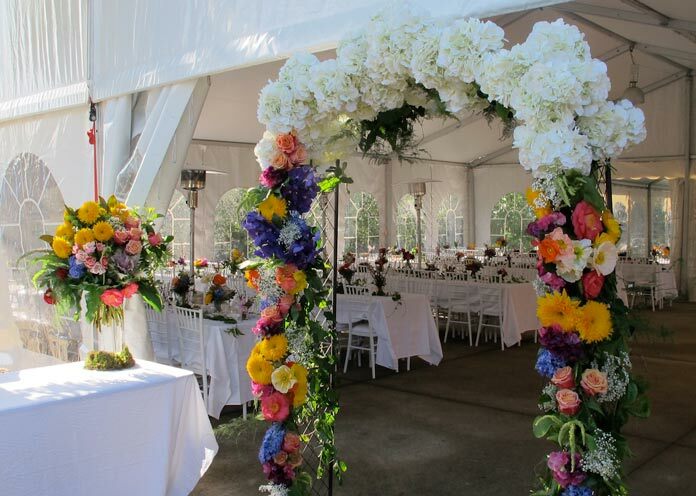 A floral arch made with exotic wedding flowers happens to be the most common and prevalent option for weddings. You need to combine the flowers like daisies, call lilies, tulips, gereberas and roses along with green leaves. This type of arch can be on the expensive side as it will require a plethora of flowers to look decorative and substantial. For a wedding during the fall, you can use yellow, peach and orange coloured flowers for the arch decoration. The intimate outdoor setting can be further enhanced with this type of garden arch. It should be about 14 foot tall and can be embellished with spray roses, gardenias and fresh ferns for creating an ethereal vibe of the woodlands. If you are going for a white arch looking celestial amidst the flamboyant garden background you should go for petunias, sweet peas, baby’s breath, white gladiolas, white orchids and lily. You can combine these flowers with natural creepers like ivy as that will make your all-white wedding arch seem glamorous and elegant. A rustic and natural wedding arch with fabulous vine detailing accents and foliage in natural accents will be great for setting the stage for the couple to exchange their vows. You may further decorate with eucalyptus, ferns and green hydrangea to augment the look. Silk flowers can be an economical solution to you and that is why if you are thinking of going for a budget wedding you should not worry much. You can create awesome hanging arches with these tulle. The silk wedding flowers can be bought at discounted prices in bulk from the online stores. The best part is that they can be reused. You can also take the help of a relative or a close friend and ask her to create exclusive silk flowers as a wedding present. You can attach a gorgeous bouquet with a host of differently coloured silk flowers to the highest point of the arch. A couple of more arrangements done in the same way can be attached near the base on every side and that will help to maintain the balance. This will give you a sweet, chic and simple photographic backdrop. This one is something that is quite simple and affordable and can be designed by anyone with an eye to the detail. So here the arch is created with the help of the willow branches. You will get all these mostly near the river. You can design the arch thus formed with exotic flowers. This is bound to create an exquisite natural look that will give the entire milieu a whole new feel. This can give rise to a beautiful arch made of birch and eucalyptus. This will look grand if you can create a rustic background. A tinge of greenery amidst the countryside ambiance can enhance the look of your venue manifolds. This has been a good idea that will help you to create a stunning wedding arch without any artificial elements. You can bend two tall hedges for creating a natural arch for the day. The hedges can be held in place with the help of ribbons or tulle. Another way you can achieve this is by making use of the natural or garden decoration ideas. You can tie palm leaves with a twine and then bend it to for creating an arch. You can go for creating a flower tumbling on a wall. You can keep it more traditional with the white flowers. This can be set up on bare walls for the ultimate impact. Though this is quite a minimalist theme but it is sure to stand out and create its own niche in the heart of your guests. This can be created with a white structure that is painted white. It is then draped with a thick rope that is picked up from a shipyard. You can affix the cluster of flowers at the top of the arch. You can try the delicate blossoms that can be fastened to the asymmetrical ropes. This will help to improve the look of the arch to a great extent. This is something that can be made without much effort. All you need are about 2000 cherries as well as branches of pears and a metal arch. When set with the right background this will look magnificent. If you are tying the knot outdoors, then pictures will be taken from both sides so you have to decorate both the front and the rear part of the garden. Ensure that the arch is firmly anchored to the soil to prevent it from being blown away by the wind. If your garden is quite well-maintained then you do not have to spend heftily for the decor. The natural setup will be able to present a remarkable milieu for you and your guests. If you are hiring avenue, you should ensure what things are included in your package. Many-a-times you can get an arch as part of it. If you are getting married at home, then you can purchase a metal arch from any local store. 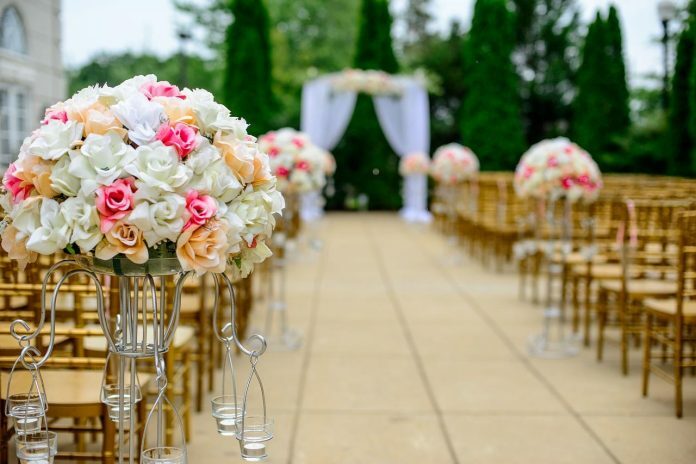 But if you want something more elaborate or don’t want to purchase something that you will just use once then you can just go ahead and opt for wedding furniture hire. This way you can rent your arch without spending a lot for buying it. Then you can work with the florist to decorate the arch just the way you want. The above are some of the ideas for garden wedding arches that will assist you to get the dream decor for your special day. 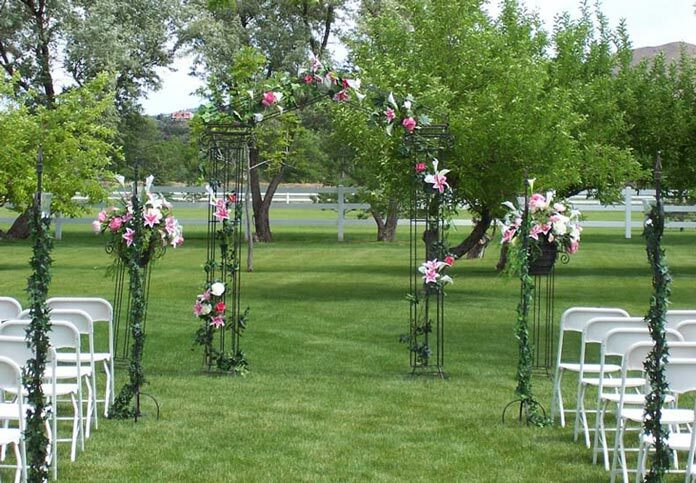 Just keep in mind that the garden wedding arches have to be adorned on the day of the wedding and not before. This way the arch décor will stay fresh and will be able to create the desired impact. If you try any of the above ideas and keep these nitty-gritties in mind you surely will be able to create an incredible arch for your big day.